Welcome to the Stone Smeltery Information Site. Before you choose a place to build the Stone Smeltery, take into account the location from Mine, Warehouse and/or other Worker(s). After you have selected a place for the Hut, you have to craft the Stone Smeltery’s Hut block and place it with your Building Tool. Once the hut block is placed, the Stone Smelter will be automatically assigned (or you can manually assign one with the best Traits for Stone Smelter if you changed this in the settings tab in the Town Hall’s GUI. Now you will have to issue the builder the “Build” assignment so it can build the “Stone Smeltery’s Hut”. Once the builder is done you can now hire the Stone Smelter and they will, upon request, turn cobblestone to stone, stone bricks to cracked stone bricks, clay balls to brick, and clay blocks to terracotta for all your Towns needs. 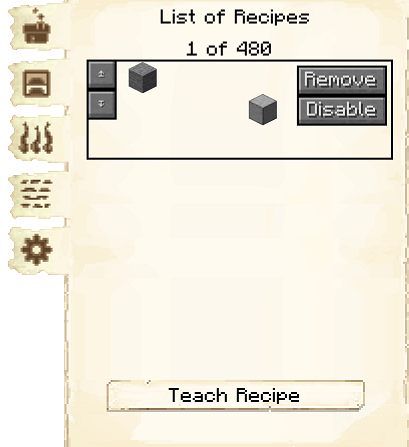 Fuel: Listed are items that can be used by the cook as fuel in the furnaces. Simply turn on any that you want your cook to use, and the deliveryman will deliver those items to the cook when they need fuel.